I've never ever been a morning person. Even as a child, I was a total night owl. As a teen, I remember staying up late studying and getting dressed/eating breakfast/finishing my make-up on the way to high school. I could hardly make it to my 10am classes in college and thrived working the late-shift at my first bakery job. As much as I love sleep and hate going to bed at a decent hour, I do, however, see the appeal of starting the day bright and early . And with the sun rising at about 5am here in Vancouver, and baby shortly after, I've been forced to embrace more early mornings, whether I like it or not. While I am usually begging for coffee in the AM, these bright, crisp mornings I've been able to witness lately have me craving something a bit more refreshing. Think fresh-squeezed orange juice and some tangy yogurt with favorite strawberry - rhubarb compote on the patio to start the day. What better way to clear your head and get inspired, right? Okay, this may all be a bit cheesy, but this early morning routine is still very new to me, so please forgive my ridiculous anecdotes of listening to birds chirping, admiring nature's dew drops on my favourite flowers, and soaking in the stillness before the hustle and bustle of the city gets going. Okay, so what does this all have to do with an Orange Creamsicle Cake? Fresh OJ, remember? Ha, yes - I know. Kind of a stretch, no? But really, this whimsical, zesty cake really does reflect how I've been feeling these days. A little loopy, but fun! And with the sun out from about 5am to 9pm (nicely done, Pacific Northwest), it is sweet treats like this that I've been craving lately. Packed away with my boots and winter sweaters are my appetite for rich, decadent, heavy desserts - making room for vibrant and refreshing treats. Plus, with summer on the horizon, I've been in the mood to create desserts that are just plain happy. 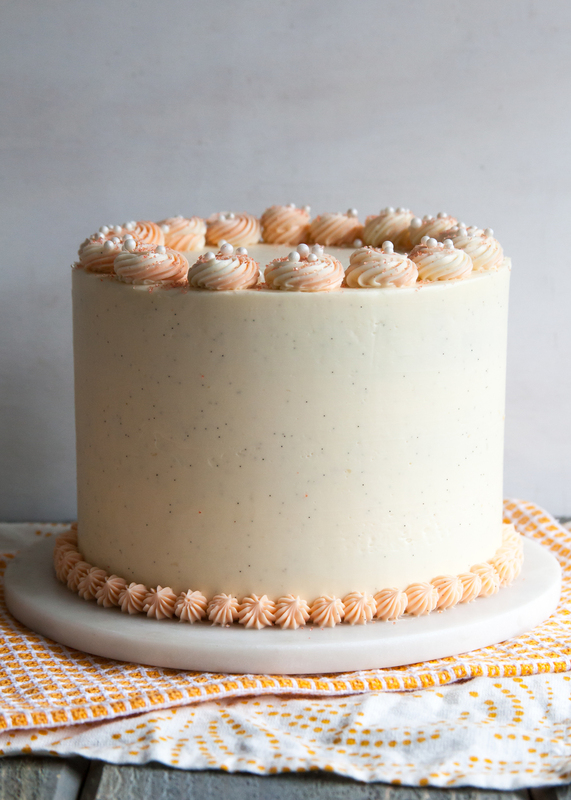 This Orange Creamsicle Cake is (dare I say?) creamy, dreamy and packed with notes of citrus and vanilla. Layers of orange-scented sour cream cake have been soaked in an orange simple syrup and paired with orange mascarpone filling. I've frosted it in a smooth vanilla bean-flecked buttercream with swirly rosettes, sugar pearls, and sprinkles! The flavours will leave you with nostalgic feelings of youth, summer break, and ice cream trucks - without the sticky, melty mess of this cake's frozen inspiration. Get the full recipe over on The Cake Blog!